Corey has been teaching guitar, piano, and brass instruments to children of all ages since 2010. In his hometown of Columbus, Ohio he spent his days teaching both all across city and in a dedicated music studio, while he spent his nights nannying four young children that he adores. 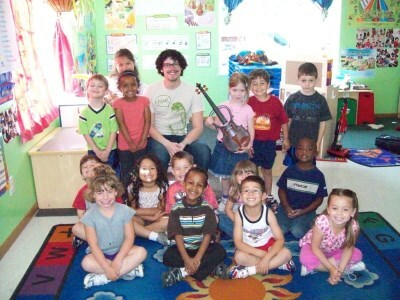 In 2008 he received his Bachelor's in Music Performance, and since then has performed as a musician for local bands, productions and orchestras - but he found that he had the most fun playing for children at daycares and preschools. His passion for music and for children has shaped him into a dedicated, empathetic teacher who can't wait to share his enthusiasm with children in the Bay Area. Mixed Ages (0-5 years). (Coming Soon) Tuesday 9:30 AM 06/04/19 8 weeks 07/30/19 Teacher Corey No class 7/2 for July 4th week. Mixed Ages (0-5 years). (Coming Soon) Tuesday 10:30 AM 06/04/19 8 weeks 07/30/19 Teacher Corey No class 7/2 for July 4th week. Mixed Ages (0-5 years). (Coming Soon) Wednesday 9:30 AM 06/05/19 8 weeks 07/31/19 Teacher Corey No class 7/3 for July 4th week. Mixed Ages (0-5 years). (Coming Soon) Wednesday 10:30 AM 06/05/19 8 weeks 07/31/19 Teacher Corey No class 7/3 for July 4th week. Mixed Ages (0-5 years). (Coming Soon) Wednesday 11:30 AM 06/05/19 8 weeks 07/31/19 Teacher Corey No class 7/3 for July 4th week.